Home /Jackon Kayak Mixmaster Review (7.5)-- It really does work for most anyone! 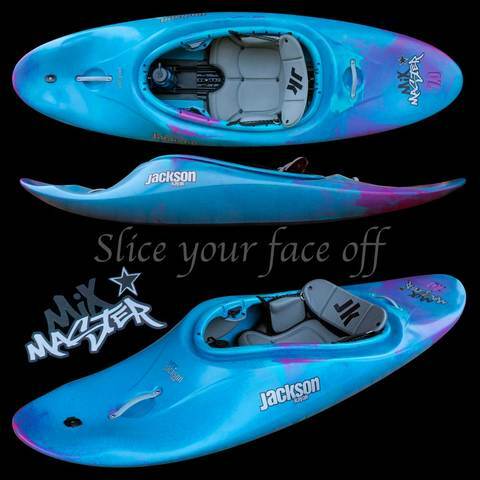 Jackon Kayak Mixmaster Review (7.5)-- It really does work for most anyone! It's no secret. I'm a huge fan of Jackson Kayaks. I pretty much exclusively paddle them. There's a variety of reasons, but many of them relate to the fact I just feel that the way EJ makes his boats work really well for my build. His company also tends to cater to most builds with their boat sizing, which has been great for me as I'm equally a fan of Mexican food as I am of Jackson Kayaks. So when the Mixmaster came out and I discovered there would only be 2 sizes, with the "larger" size's maximum paddler weight being notably below my weight... I was not stoked and honestly felt like Jackson was losing it's way with it's recent ventures into fishing kayaks. My concerns have been laid to rest though, and here is the summary of my experiences with the boat thus far. The short summary of it all. Some information about me so you can tell how this may relate. This is a downright rad boat. If you can run rapids in a Rockstar, this boat isn't all that much different in class 3. It --really-- does work for any decently skilled playboater and connects ends and squirts like a boss. The fit was a bit part of the adventure of making this boat work for me. There's more flexibility to fit than obvious. Unfortunately, all the aspects of the outfitting are not modular so a demo might be either too snug for you, or already customized for some one larger. If you're considering this boat but worried about fit, I'd say try and check one out at a shop. Insist that the shop remove the front foam pillar, seat pad and the foot foam. If you can fit in the boat after that, then you can customize the outfitting the rest of the way to make the boat work for you, I assure you. After you get it dialed in and are comfortable enough, this boat will connect ends like no ones business. It'll rotate differently through the water than a rockstar, but with a few small adjustments to technique and cadence you'll be killing it in no time! I'm 5'10, and weigh in at 235lbs. As far as build I'm heavy set but can bangout pushups and situps so take that as you may. I've got size 10.5 to 11 feet depending on the shoebrand. I do not have a long inseam (long legs) and generally wear 30 length pants, although I do wear my pants low on my hips. I'm a decent boater. I primarily like to playboat in class 3 with the occasional 4 thrown in for fun, but am quite competent and comfortable in class 4. I take my antix down the local classic easy class 4, the East Fork Lewis, and run both waterfalls on the way down. I'm an ACA level 4 whitewater instructor. I can cartwheel, splitwheel, wavewheel, splatwheel, squirt, squirt wheel, backwheel... you name it, I can get vertical. I'm to fat to loop... or so I keep telling myself. I finally got the opportunity to jam myself in the boat shortly after my local kayak shop (Alder Creek Canoe & Kayak) received their demos. I was instructing for them at a wavepool that night, and hopped in the kayak. I experienced the kayak as I expected for being over the weight range. My feet hurt and were uncomfortably jammed in, my thighs were squished by the thigh hooks, and the hip pads were very uncofortable. I found the boat especially tippy, and a major workout to keep upright... and even then I spent most of my time stabilizing forward with my core and it tired me out. Overall, I was really let down that all of EJ's videos informing me that the mixmaster would fit everyone seemed to be hogwash. As far as how the boat paddled, yeah I could squirt and cartwheel it, but I was so uncomfortable and cramped up in there I wasn't able to use my muscles properly for even basic stability, let alone really nailing complex manuevers. I felt the boat had missed it's mark for people such as myself. Hindsight being 20/20 I should have known that a boat like this out of the box wouldn't work for me. It's modular and meant to be customized to it's owner. To be fair though, Jackson didn't seem to think through making this boat as accesible as possible as a demo boat for people to try out, they just sent it out the same way it'd ship if you bought it. A good friend of mine Tim is similiar in height, foot size, and stature, but is about 20lbs or so less than me, if not more at this point. He ordered a Mixmaster right away as he is really into old school slicey boats, and figured this would just be a natural improvement upon designs of yesteryear. In his eyes, it was exactly that, and we had a disagreement about the boat and fit. I unfortunately had to go and eat a whole bag of crow after hopping in Tim's Mixmaster 7.5 at the Columbia pool. He'd made a few key adjustments (that I will later cover) and when I hopped in his boat I not only found it fit, I found it spacious and comfortable in the feet. The boat was still a bit meh in the hips and thigh braces however, but notably improved. I also later was able to work around these, mostly. Despite the fit imperfections, I was now able to quickly take to performing all sorts of fun tricks in his boat. I linked tons of ends cartwheeling, splat wheeled the side of the pool for many ends on end. I wrapped up the session thinking the Mixmaster could be a fun boat for me at the pool or on really easy whitewater, but it would largely be a pool toy so I was still not quite sold on ponying up the money to buy the boat just yet. Shortly after paddling Tim's boat, I modified the demo boat that Alder Creek Canoe & Kayak had to match Tim's configuration, with a few details specific to myself. Yeah, it's a bit selfish, but given what came out of the box was downright miserable and most people demoing it were at least similar in height and shoe size to myself, I figured I'd go for it. At the very least my build was more common than the boat being outfitted for the smallest person likely to try and squeze in it. A few days later, the boat went to Northwest Creeking Comp so some boaters could try it out and people could get to check it out. It was there that one person demoing it also removed the seat pad, something Tim had not done. The time came for me to actually take the boat out on the river. I stepped out of work a bit early to run the Washougall River, a nearby river with progressively more difficult rapids the further up you go, capping out at a fun class 4 rapid. I went to the takeout before our planned arrival time so as I could get some seat time in the boat and make sure this wasn't going to be a dumb idea, given I am notably over the paddler weight and even more so with all of my gear. It turns out the boat had been adjusted out of my preferred position, and with some minor adjustments was right back to pretty damn comfortable to infact improved due to the removal of the seat pad. I was able to manuever around the river with ease, cartwheel, squirt, splitwheel... etc etc. We drove up the river to the MP5 put in (2x class 3's and lots of 2+'s) and proceeded from there. I found I was able to tackle class 3 whitewater with almost no problems at all. While some boat control and posture awareness was necessary, it didn't feel any more difficult than my Rockstar, and barely more involved than my Antix honestly. I was able to manuever through rapids, adjust river position, ferry, catch eddies... really the boat wasn't all that much different from any other boat as far as capabilities. Some adjustments were needed to make it happen, but they were all fairly intuitive. At no point did I feel the boat catch me up. The few times I struggled, it was entirely self inflicted. Wave wheeling through the middle of rapids and going too vertical, dropping my tail in a shallow eddy and hitting the bottom (this will flip you pretty good), getting stuck in a whirlpool in a stern squirt and wondering just how long you might be stuck going around for... that sort of fun shennanigan induced trip ups. On the stretch down I got progressively more aggresive. I started going for hero eddies that I love to catch in my bigger boats, wave wheels down the middle of rapids, squirt in and out of mid rapid eddies, get stuck in some holes and manuever in and out. Overall, the boat was a real blast with little to no real downsides. The only struggles I can really quantify were that the hip pads are still a bit much for me, so further customization needed. A boat this squirt also REALLY works your core as you get vertical so damn much and are balancing it all out with your car. That's a personal fitness problem this boat will surely help resolve. The main river struggle I ran into though was I struggled to catch surf waves on the fly. The Antix surely has this boat beat, but it's not impossible. With some additional paddling perhaps I can figure it out. The following are the outfitting customizations I took upon myself to make with the boat that make it notably more livable. I also recommend you follow these steps in order. I however cannot promise these are safe or ideal. I'm no engineer, just a kayaker. Cut the center pillar back so your heels can touch. The center pillar foam runs quite far forward, supposedly further than intended from the factory according to EJ. This forces your feet to point a lot more than desired and is really uncomfrtable. Removing this bit of foam adds a lot of foot room and provides relief to your ankle. I personally cut the foam back to the forward dimple that helps keep the foam centered. Warning: This could compromise the ability for the foam pillar to prevent the boat from being crushed onto your feet, pinning you in the boat. I honestly have no idea, I just know without this adjustment there is simply no way I was going to be able to fit in this boat. Cut the foot foam block back for leg length. This will buy you some significant space and is probably the most obvious thing to do. It definitely is to be done after the first step in my opinion however. I would make all determinations doing this with your booties or neoprene socks on to ensure you get the measurement just right. Move the seat position based on your weight, not fit. My personal experience is that the heavier I am in a playboat, the more it helps to be forward keeping my overall weight up in the larger volume around the knees along with the wider hull area that entails as well. I personally am one position forward of center and the boat works great for me. A lot of people just move the seat position to make themselves fit in a boat. I really cannot recommend this unless you are some abnormally large (or short) height. I would adjust for trim. If you don't believe me that being forward adds such stability, try leaning all the way back and telling me how stable you feel. Repeat steps 2 and 3. Switch back and fourth to get the seat position and feet just right for whatever seat position provides the best stability. Add foam to the center of the foot block to match the contour of your feet. Yeah your ankles will touch, and the balls of your feet, but what about everything inbetween? Put some foam in there. It'll feel better on your feet and spread the weight out when pushing down through tricks or whatever other manuevers you feel the need to stop on the accelerator for! Remove the Seat pad. Just give it a go. You can pop out the "tree" fasteners easily, and get replacement ones CHEAP from any autoparts store worth a damn. This drops your height down notably, improving stability. It also changes the angle of your legs, in my case taking notable pressure off of my thighs from the incorrect thigh angle This does reduce your leverage over the boat, but the thing is so damn slicey anyways you give up very little and gain a ton. Heat and dimple the seat where your tailbone goes. Without the pad, the seat is not contoured properly and puts pressure on your tailbone, or at least in my case puts pressure on my tailbone. Heat that area up, dimple it a bit, and you'll be notably more comfortable afterwards.